Was it 2006 all over again at OPDC? “Back in the fall of 2006, the California Department of Food and Agriculture shut down Organic Pastures Dairy Co. after the state identified six children it said were sickened by E.coli O157:H7. Inspectors invaded the dairy and carried out hundreds of manure and environmental tests. The dairy was only allowed to resume productionsome two weeks later, after its owner, Mark McAfee, called a press conference to protest that the CDFA was dragging its heels in lifting its quarantine–he threatened legal action and consumer protests. 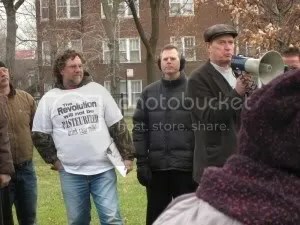 “In the second of a series of events organized by the Farm Food Freedom Coalition to defy the prohibition on transporting raw milk across state lines, last Thursday, December 8th, a group of “Raw Milk Freedom Riders” brought 100 gallons of milk by caravan from Wisconsin to Chicago’s Independence Park. Upon arriving at the park, the caravan was joined by supporters wielding cow bells and cookies, braving the 30-degree weather to stand up for their food freedom.